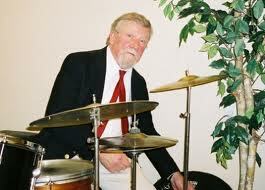 I offer this as a remembrance of clarinetist Frank Chace, one of the most elusive of men. He and I had perhaps ten phone conversations and a dozen conversations-by-mail at the end of the last century, continuing into 2003 or so. At first, I think Frank was flattered by my interest, intrigued by someone so curious, so intent, but soon he retreated back in to the shadows. I can remember the odd feeling of telephoning him on an early Sunday evening and hearing the phone ring on. I picture him waiting for it to stop ringing. But he did respond to my hero-worshiping curiosity in whimsical ways. A cassette he had mentioned, a concert recording of himself with Marty Grosz and Dan Shapera — something he thought he had lost but surfaced unexpectedly — came to me in an envelope, with a few words handwritten on a scrap of paper torn from the back of an envelope. Earlier, I’d asked him for a picture (don’t all fans do this?) and he’d sent a newspaper clipping with a dim photograph of him as one tiny figure in a band. 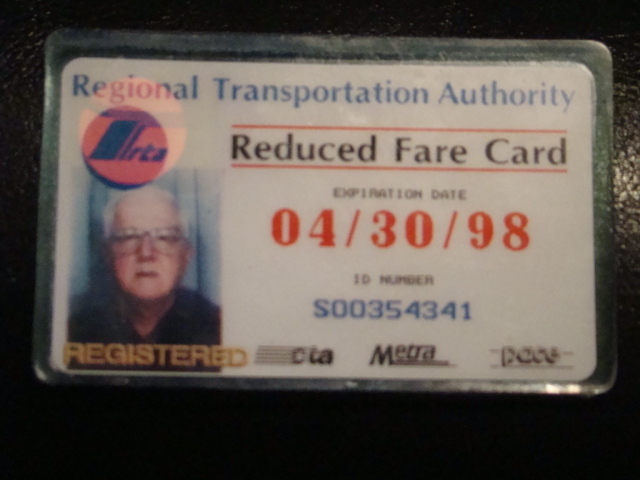 Then this — his expired bus pass, with Frank staring in to the camera in that fixed pose we all assume for drivers’ license photographs. I find this more than remarkable — impassioned and perfectly controlled, brave and searching. Terry tells me that there are other minutes of Frank, but for now I savor this brief intense sighting. It is like nothing else I know. There is the sound — and even more, his physical presence . . . especially the half-embrace he gives himself and the clarinet at the end, a rare moment of pleasure he allowed himself. And us, for all time. Posted in "Thanks A Million", Generosities, Irreplaceable, It's A Mystery, It's All True, Jazz Titans, Pay Attention!, Swing You Cats!, The Heroes Among Us, The Real Thing, The Things We Love, Wow! Although it’s always a pleasure to hear JAZZ ME BLUES, for instance, listeners like to be surprised as well — not by mere novelty (playing the theme from FROM RUSSIA WITH LOVE in hot style, for instance) but by songs in the idiom that aren’t overly familiar. 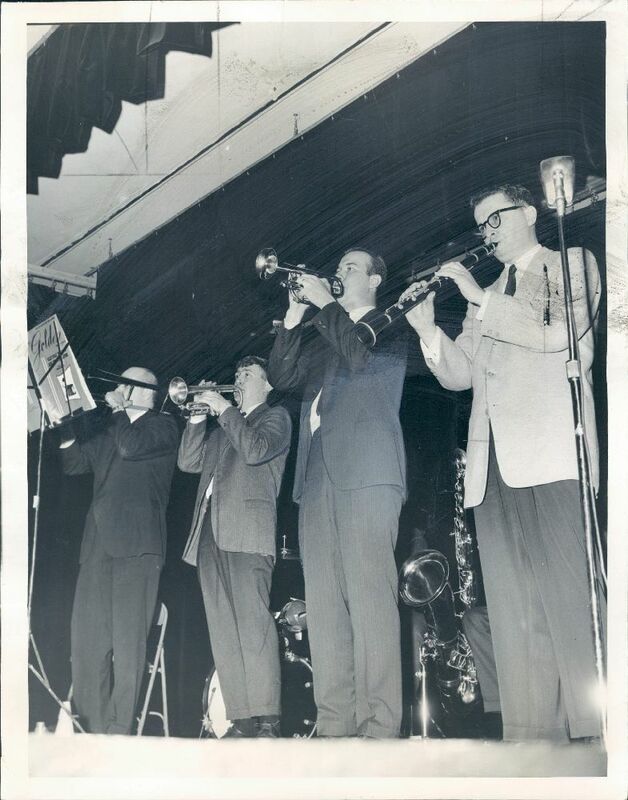 Here are two such performances from the 2010 Tribute to Bix, played by Andy Schumm and his Gang (Andy, cornet; Dave Bock, trombone; John Otto, reeds / vocal; David Boeddinghaus, piano; Leah Bezin, banjo; Vince Giordano, bass sax, tuba, string bass; Josh Duffee, drums). It’s not the most inventive song — the three-note motif gets repeated cheerfully, almost without letup, but it bounces along. The second, DON’T WAKE ME UP, LET ME DREAM, is more obscure (Abel Baer-Mabel Wayne) and has a certain oblique similarity to GOOD LITTLE, BAD LITTLE YOU — but it, too, gets a jaunty performance. In this version, Vince got to take a much-needed breather and his place was taken by Mike Walbridge on tuba. And Andy pounces on the melody from out of the ensemble in fine Goldkette style! We have the intrepid Flemming Thorbye to thank for these videos: from the back of the hall, but steady and in clear sound — all that anyone could want and more!